Manitowoc Co. (MTW) is a maker of cranes and other heavy machinery. A caller asked about it during the Lightning Round of Mad Money on Monday night. Our own Jim Cramer said, "It's so cheap it drives me crazy, but I'm not backing away from it down here." Let's check out the charts and indicators again. In this daily bar chart of MTW, below, we can see that prices have been in a downtrend the past 12 months. Prices have spent much of the time below the declining 50-day moving average line but there have been some times when prices did rally above this indicator. This February is one of those occasions. The daily On-Balance-Volume (OBV) line has been in a decline but there is a glimmer of stability from late December. In the lower panel is the 12-day price momentum study which shows higher lows from October to December to January while prices made lower lows. This is a bullish divergence and tells us that the pace of the decline has slowed. A decline slows when buyers are attracted. In this weekly bar chart of MTW, below, we only see marginal improvement in the indicators. Prices are still below the declining 40-week moving average line. The weekly OBV line now shows a higher low but still needs a higher high to start an uptrend. The MACD oscillator is still well below the zero line. 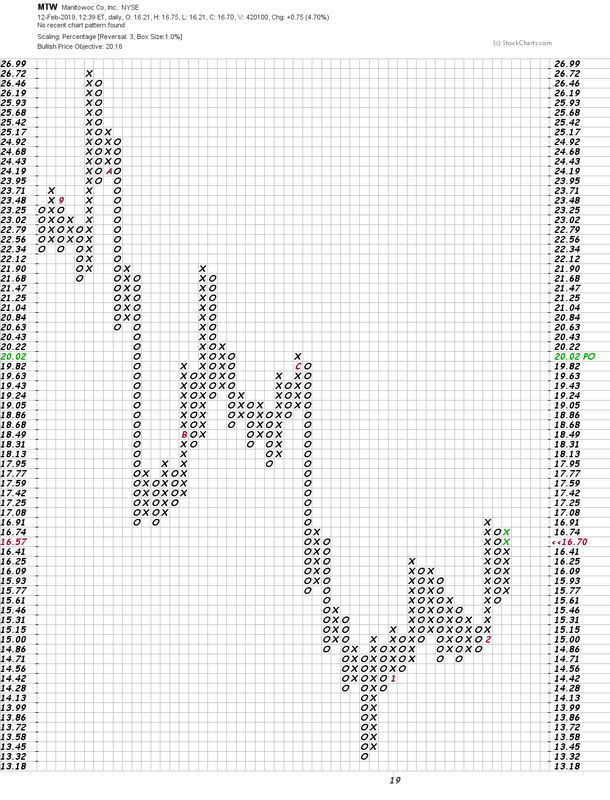 In this Point and Figure chart of MTW, below, we can see a small base pattern and a modest upside price target of $20. Better than a sharp stick in the eye, as they say. Bottom line strategy: just maybe the worst is over for MTW. A lot more base building is needed before the charts become attractive.